It is unlikely that the heroic and seductive feats of Cleopatra will ever be forgotten by history. Even if you’re totally apathetic to learning about Ancient Egyptian history, there’s a good chance that you will have heard of the last Pharaoh of Egypt, even though she died in 30 BC. Not many of us can look forward to the prospect of retaining fame for thousands of years, so we may as well celebrate the mystical and exotic allure of one woman who did. While online slots may not be a historian’s most recommended way to learn about history, there’s certainly enough historically-accurate allure in Legends of Cleopatra to pique your interest in the eventful time of Cleopatra’s ruling. To ensure that you get the full experience from playing the Legends of Cleopatra game, we’ve outlined a brief history of the last Pharaoh of Ancient Egypt. Princess Cleopatra was born to Pharaoh Ptolemy XII. Instead of spending her time preening by the pool which is depicted in the backdrop to the Legends of Cleopatra online slot game the princess who was renowned for her cunning wit, seductive personality and eagerness to gain a position of power was keen to spend time near around her father. At the point of her father’s death when she was aged just 18 she came into power as the co-ruler of Egypt with her younger brother. Considering that they played by the Game of Thrones rules back then, Cleopatra was married to her 10-year-old brother. Given that he wasn’t exactly mature enough to rule after their father’s death, Cleopatra took charge. As her brother Ptolemy XIII aged, he began to resent Cleopatra for her natural dominance and overthrew her, which led to her being thrown out of the palace. Her younger brother may not have wanted her around, but Cleopatra was never short of male attention, and she attracted the one and only Julius Caesar who valiantly came to the overthrown Pharaoh’s rescue. Julius Caesar made light work of Ptolemy XIII in a great battle which is unlikely to ever be forgotten in history. While Cleopatra was back in her much-deserved position of power, she found the time to fall in love with her new ally and it didn’t take long for their child Caesarion to be conceived. Even though Cleopatra and Caesar were betrothed and parents to Caesarion the couple still lived separately, Caser in Rome and Cleopatra in Egypt. She watched her Kingdom thrive under the trade deals formed with Arab Nations, yet, they remained happily married until Caesar was assassinated. The death of a ruler in the Ancient Roman Empire is always shortly followed with the rise of another. So, it wasn’t long before Marc Antony popped up and stole her heart, yet, they weren’t without their enemies. The couple’s main adversary was Caesar’s legal heir Octavian who drove both Antony and Cleopatra back to Egypt. In a Romeo and Juliet style ending, Antony and Cleopatra were separated after they fled, rumours got to Antony that Cleopatra had killed herself, unable to deal with the grief he ended his own life. When the news of Antony’s death reached Cleopatra, she found herself all too receptive to a deadly bite from a Cobra. Now that we’ve got you Interested in the tale of Cleopatra’s sad, seductive and scandalous life, we’ll run you through how the ancient princess inspired the Legends of Cleopatra slot. We’re not going to pretend that the Legends of Cleopatra slot is one of the only Egyptian-themed slots available to play online today. There’s a fair few. Yet, knowing this the game designer Playson games stepped up their own game by cooking up an innovatively spectacular game to rival the existing Egyptian-themed slots. The graphics to the Legends of Cleopatra Slot may snare you initially, yet, once you start spinning the reels, you’ll definitely stay for the progressive nature of the game which gives you plenty of ways to win and exciting bonus features which we will cover in more detail below. Thankfully there are no cobras waiting to bite you in Legends of Cleopatra, yet there are many other icons of the era which pop up on the reels as they seamlessly spin. Whether you choose to play on Amigo Slots via mobile or web, you’re in for a high intensity graphic treat. But remember, for the ultimate gameplay experience you will want to crank up the volume you hear the mesmerising soundtrack to Legends of Cleopatra unfold. If you’re on the go playing the online slot you may want to carry earphones! 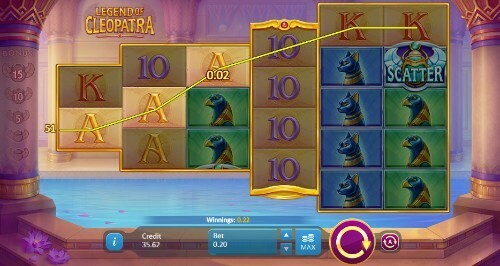 The unique set up of the reels on Legends of Cleopatra will be the first thing which catches your eye about the design of the video slot. Yet, after a few spins you’ll quickly get used to the sideways pyramid format of the six reels. Reel 6 and 5 will feature five rows, reel 4 will feature four rows, reel 3 and 2 will feature two rows, and the first reel will only feature one row. Don’t be put off with by the unique set up. With a few spins you’ll soon get the hang of the reels – remember you can always play in free mode before you place a bet. Behind the unique set up of the reels, you’ll see a background of an irritably inviting Egyptian bathhouse which makes diving right into the game that little bit more irresistible. The theme may be set in a time before Jesus, yet, that doesn’t mean that the HD graphics aren’t laden with mystic treasures being fit for the 21st century. If you’re expecting a glamorously slick and sophisticated gameplay experience you won’t be disappointed. Along with the typical lower value symbols on the reeks which appear as letters, there are also plenty of Egyptian-themed symbols popping up such as Pharaoh dogs, Sphynx cats and Scarab Beetles which act as the Scatter cards. Each of these animals and insects were held as sacred under the religion which the Ancient Egyptians followed. In respect for the fallen Pharaoh there were no Cobras include in the gameplay. The return to player (RTP) rate for Legends of Cleopatra stands at a generous above average of 95.05% the reels will always spin in your favour. There are also 100 pay lines for Legends of Cleopatra, the maximum stake amount for each is £1, which makes the maximum stake amount £100. So, whether you’re spinning the reel on a budget, or have a princess-sized bank account Legends of Cleopatra will certainly be of appeal. If you’re looking for a relaxed game play experience where you can sit back and watch the reels spin, the auto-spin feature has you covered, or, you can always get even more immersed with the manual mode. As we’ve previously stated, the main selling point for Legends of Cleopatra is the amount of bonus features which the game developer’s have packed in with the HD video slot which gives you over 100 different ways to win. Here’s what you need to look out for to make the most of your money! The Legends of Cleopatra symbol is the highest paying symbol in the game. The logo can pay out either 50x, 125x, 250x, or 350x the initial value of your winning combinations which have appeared on the reels through matching the lower value symbols of 3, 4, 5, and 6. Along with the Legend of Cleopatra logo look out for the Wild symbol, which the game designers have made easy to spot. The Wild symbol simply appears as ‘Wild’ in shiny golden lettering. This Wild will replace every symbol apart from the Scarab beetle Scatter symbol to help you to snag more wins. If one wild feature wasn’t enough for you, you’re in for luck, Playson have included an exciting Double Wild Reels feature which will be triggered when any reel is stacked full of wilds. Given that some of the reels only have one or two rows, this is a lot easier to activate than if you were playing on a traditional 5x3 reel. Once the Double Wild Reel feature is triggered yet another reel will be chosen at random and filled with Wilds! Given that free spins are often what draws players to online slot games, Legends of Cleopatra have made sure that their free spin offers are too good to refuse. To activate the free spins, be on the look out for the Scarab beetle scatter symbol which has the ability to grant you a variety of free spin amounts. Yet, the free spin round in Legends of Cleopatra isn’t your average free spin round. You’ll see the pyramid flip on the screen as the base of the pyramid now lies on the left side of the screen. But that’s not going to be what gets you excited about the free spin rounds – the ability to retrigger the feature up to 50 times will be! Legends of Cleopatra was created by one of the fastest evolving game developer’s Playson. Even though the small company may be fresh from inception, they have already made a myriad of games which wormed their way onto the top lists of 2018. Once you spin the reels on one of Playson’s games, you’ll soon see how they got their acclaimed status in the industry. Their games have been created with innovative tech and capacity to create viscerally stunning HD graphics. At the end of 2018 Playson had over 40 online slot games in their portfolio which includes Crystal Crush, Lucky Staxx: 40 Lines, Wild Warriors, Fruits & Jokers: 40 Lines and Book of Gold Double Chance. If that wasn’t enough to get you excited why not explore the similar games on offer from Playson down below. It’s clear to see that the passion for Egyptian Mythology runs hotly through the Playson office, out of the 40 plus games they have on offer, they are home to four different Egyptian-themed video slots including Legends of Cleopatra, Book of Gold: Double Chance, Rise of Egypt and Treasures of Tombs: Hidden Gold. There are slight variations in each of the games, to ensure that there is an option for every player looking to dive into the mystic allure of Ancient Egypt and be in with the chance of snagging real cash pay outs. Book of Gold: Double Chance Online Slot: Book of Gold: Double Chance is an online video slot with a simple 3x5 set up, and ten different pay lines. Yet, there are plenty of features to entice you into the gameplay such as the Scatter-Wild symbol and ability to get your hands on some free spins! Look out for the high value book symbol which will replace all other symbols aside from the scatter symbols when you bet on any pay line. The generous book symbol will also give you 10 free spins. Rise of Egypt Online Slot: Rise of Egypt is one of Playson’s newer games which was released in July 2018. If you’ve already got bored of the tale of Cleopatra, you can unravel a totally different side of ancient Egyptian mythology. Legend has it that Ancient Egypt was once forged and ruled by ancient and long-forgotten gods. Yet, the Rise of Egypt Slot will bring them back to life once more. Along with giving you the chance to win eyewatering amounts of cash through the 3x5 reel set up and 20 different bet lines. Treasures of Tombs: Hidden Gold Online Slot: Treasures of Tombs Hidden Gold is the sequel to the original Treasures of Tombs game which slot fans adored when the game was first released. Yet, as the landscape of online slots is forever evolving, Playson stepped up to the innovate plate with the follow up game. Even though a lot of the improvements can be seen in the graphics, much of the innovation behind Treasures of Tombs: Hidden Gold went into ensuring that the gameplay was seamless on both mobile and laptop. The online slot is set up in the format of 5-reels and 9 rows, and you’ll have plenty of chances to land some free spins when you are lucky enough to find the scatter symbol. There’s a much more interactive feel behind this game; stunning animations pop up when wins are triggered giving you an unforgettably vibrant game play experience. Ancient Egypt Classic Online Slot: Ancient Egypt Classic is Pragmatic Play’s innovative answer to Egyptian-themed online slots. As ever, the game designer went all out with their graphics which will perfectly depict the history of Cleopatra. The 5-reel slot offers 10 different bet ways and a very generous return to player rate of 96.45%. Ave Caesar Online Slot: Given that Caesar was a big part of Cleopatra’s story, why not check out Ave Caesar which follows Caesar through his attacks on the Roman Empire. Thankfully, you won’t need a wallet the same size as Caesar to play the game – Ave Caesar gives reel fans the ability to place bets from as little as £0.01 or as much as £60 with 20 different bet lines which is perfect for anyone who is still getting the hang of spinning the reels. Egyptian Queen Online Slot: The Egyptian Queen online slot packs in an exciting range of features, including three different wild symbols which isn’t something that many game designers offer. The Wilds feature along the opportunity to land free spins by the Queen’s treasure symbol appearing on the reels. Good news! You can log in and play on Amigo Slots wherever you are from your mobile alongside the ability to play via a web browser. So, if you’re keen to spin the reels on the online slot on your way to work or while you’re waiting for the bus, you’re in luck. As long as your Apple or Android device can support the HTML5 game, you’ll be good to go! You’ll just need access to a stable internet connection. Amigo Slots weren’t the only online casino who were keen to partner up with Playson and their uniquely exciting online slots. In 2018 Playson also ended up partnering up with online casinos such as Money Reels, Jokerbet, Dench Solutions, Casino Gran Madrid, Circus.ES plus plenty more. Playson have also been more than happy to interact with their fans at conventions such as Sigma which is Malta’s largest electronic gaming gathering. They used the event to gather feedback from their fans which will no doubt contribute to the innovation of their future games. Why is Amigo Slots the Best Place to Play Legends of Cleopatra?